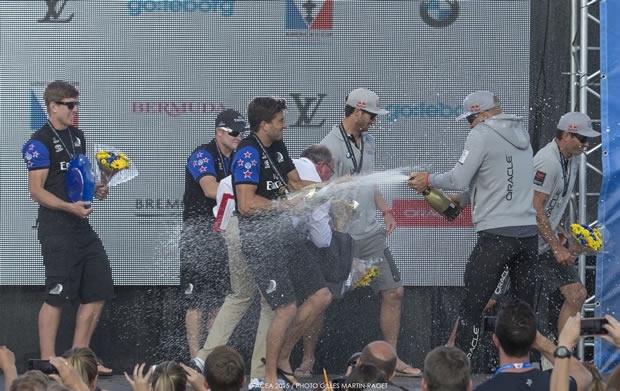 Emirates Team New Zealand put together a Super Sunday in Sweden, to vault to the top of the leaderboard and claim the Louis Vuitton America’s Cup World Series Gothenburg. It was a difficult day on the tight race course, with light and shifty condition, but the Kiwis, led by skipper Glenn Ashby and helmsman prodigy Peter Burling showed no fear, posting a 2-1 scoreline in the two double-point races. “It was a tricky afternoon, but our guys had a forecast for it being light like this for quite a few days, so we’ve been preparing for it since we arrived,” Burling said. Saturday’s leader, Oracle Team USA, came in to the day on the back of a perfect scoreline in the first two races. But on Sunday it was a different story. Two fourth place finishes dropped the defending champion of the America’s Cup to second place. Land Rover BAR won the first Louis Vuitton America’s Cup World Series on home waters in Portsmouth. Two second place finishes on Saturday had the team poised for another top finish, but a poor start in the last race put the team in third place for the Swedish stop. SoftBank Team Japan was in fourth place, with a strong final race giving a boost to the team’s confidence heading into the next event in Bermuda. “The goal today was to get better starts and get around the first mark in good shape and we did that,” said skipper Dean Barker. “It didn’t translate into the results we wanted in the first race, but in the second race today, we nailed it. Another team looking for positive signs was Groupama Team France, who raced without regular tactician Arnaud Psarofaghis, on a day that called for good tactics. The day started well for the hometown heroes on Artemis Racing, who have struggled to put together consistently good results. That pattern would continue. An inspiring win in the first race was followed by a last place finish in the second. “We got a ripper of a start in the first one and when you get ahead of the pack in these conditions it can roll into a massive lead,” said skipper Nathan Outteridge. “We’ve been working really hard as a team to fix our issues. Yesterday we sailed well but didn’t get the results which was very discouraging, but I kept reminding the guys it will come, we’re so close. So to put it all together in that first race was great for our fans, our team and for us on the boat as well.